A few eyebrows were raised in the office when I said I was calling in some products from Leica. F&C shares office space with two photography magazines and although the name was familiar enough the notion of Leica producing equipment that could be directly beneficial to furniture makers was something of a surprise. Leica Geosystems have been producing devices for capturing and recording data for the construction industry for a long time. Their reputation in the photographic industry for producing some of the best lens and metering equipment makes them the perfect choice for accurate and reliable measuring equipment. The D3 is full of features that are easily accessed and no more complicated to use than a mobile phone. The display is clear, bright and visible in natural daylight and perfect for use in low light situations. The display will capture and store the last four measurements taken and carry out simple maths as you would do with a calculator. Pre-set functions make it possible to calculate total wall lengths and ceiling areas at the touch of a button. Accurate to within plus or minus 1mm and with a range of 100m, the D3 also has an integrated tilt sensor which allows you to determine angles up to plus or minus 45 degrees. It will also obtain absolute horizontal measurements. The Pythagoras function makes it possible to capture measurements that are out of reach. No longer will you have to stand on a chair to measure the distance from the top of a window to the ceiling. This can in fact be done while sitting on the chair. I like the fact that the D3 is small compared with similar devices. The two AAA batteries were still going strong after I, and countless others, had spent a considerable time familiarising ourselves with its features. Rangefinders like this will never replace the tape measure, but you will never have to ask someone to hold the other end. 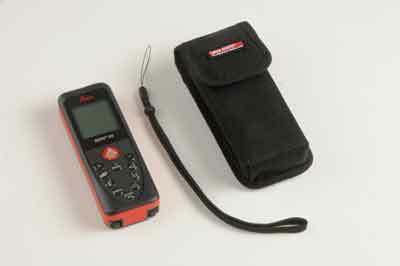 Once you have used one you will never want to go on site again without one.